100% Free online video downloader; Intergrate video playing function; Support multi-downloading tasks and multi-threads; Support more video site, more than 200+ online video sites; Support most popular YouTube, Google Video, Myspace, Yahoo Video. 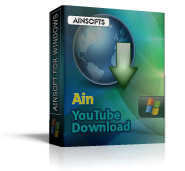 ainsoft YouTube Download, a powerful FLV video downloader app, just 100% free and clean, without any Spam or Spyware. When you enjoy fantanstic and the newest video on YouTube, using this app you can also download those YouTube FLV video follow the copyright automatically after one-click, it supports multi-downloading tasks and multi-threads. Download YouTube video to Hard disks, playing them on your computer fluently. It supports to almost all the popular video sites, such as Youtube, Google Video, Myspace, Yahoo Video, etc. With a powerful core, YouTube or Yahoo videos can be automatically downloaded in batches.